The Cleveland Browns and the Steelers have been divisional rivals since the two cities' teams began playing against each other in 1950. 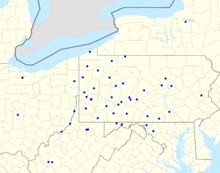 After posting a 9–31 record in the first 40 games of the series between the two cities, the Steelers recently took over the all-time series lead for the first time ever (64–56); partly due to their dominance over the post-1999 Cleveland Browns franchise and won twelve straight before the Browns snapped their losing skid against them by beating them 13–6 on December 10, 2009. Additionally, the Browns lost 16 straight years in Pittsburgh from 1970–1985 and posted an abysmal 5–24 record at Three Rivers Stadium overall. Former Steelers head coach Bill Cowher coached the Browns special teams and secondary before following Marty Schottenheimer for a brief tenure as Kansas City Defensive Coordinator, and then hired by Pittsburgh. This has only intensified the rivalry. The Steelers lead the all-time series with 75–58-1, with Week 1 of the 2018 season marking the first time (21-21) the two teams tied each other. The Baltimore Ravens and the Steelers have had several memorable match-ups and have a bitter divisional rivalry. Both teams handed the other their first losses at their current home fields. The Steelers won the inaugural game played at Baltimore's M&T Bank Stadium in 1998, 20–13, and three years later the Ravens handed the Steelers their first-ever loss at Heinz Field, 13–10. Later that season (2001) Pittsburgh won a divisional playoff game 27–10 against Baltimore, who was the defending Super Bowl champion. During their NFL championship season in 2000, the Ravens defeated the Steelers in Pittsburgh, 16–0, in the season opener with the Steelers later exacting revenge, 9–6, in Baltimore (the Ravens' final loss of the season). 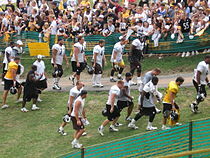 During the Steelers 2008 Championship run, they beat the Ravens three times, including a win in the AFC Championship game. The Steelers lead the series (begun in 1996), 16–10. The two teams complement each other by consistently fielding strong defenses in their division. 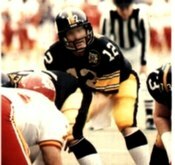 The Steelers lead the all-time series, 27–22. The Cincinnati Bengals–Steelers rivalry dates from the 1970 season, when the AFL–NFL merger was completed. In 1976, the Steelers kept their playoff hopes alive (they later won the division) with a late-season 7–3 win in snowy Cincinnati. One of the most memorable games was the 2005 AFC Wildcard playoff game, in which the Steelers, en route to a Super Bowl title, won a 31–17 come-from-behind victory after Bengals QB Carson Palmer was forced to leave the game with a knee injury. The injury happened when nose tackle Kimo von Oelhoffen contacted Palmer's knee during a passing play. The Bengals players called this a dirty play; the NFL ruled that it was accidental and did not fine von Oelhoffen for the hit. The incident led to an intensifying of the rivalry. The Bengals beat the Steelers in Week 13 of the 2005 season 38–31, and wide receiver T. J. Houshmandzadeh used a Terrible Towel to polish his cleats while walking up the tunnel after the game, fueling the rivalry. The Steelers and Bengals finished 2005 and 2006 with identical records (11–5 and 8–8 respectively), splitting both regular-season series, the Bengals winning the tiebreaker both years due to having a superior division record. The Steelers also are responsible for ending the Bengals' season in Cincinnati two years in a row, eliminating them from the playoffs in 2005 and taking them out of contention in 2006. The rivalry has become more intense again since the 2015 season. A central figure is Bengals linebacker Vontaze Burfict, not seldomly inflicting questionable hits, resulting in serious injuries to several Steelers on multiple occasions. In the 2015 Wild Card playoff game in Cincinnati, Burfict (after injuring Steelers Quarterback Ben Roethlisberger) was the culprit of a late penalty directly responsible for an extremely unlikely 18-16 Steelers comeback victory. The Steelers' victory continued the Bengals' 14-year streak of seasons without a playoff win in what is, as of the end of the 2018 NFL season, the Bengals' last playoff game. The Steelers lead the all-time series, 63–35.